"Tropical Dreams is THE BEST!! Bill has been servicing my saltwater tank for 16 years. My tank is always beautiful; my fish are happy and healthy. My friends always comment on how beautiful it is. 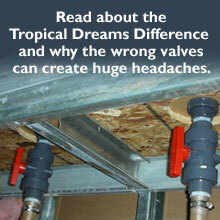 You cannot find anyone more experienced, honest and reliable than Tropical Dreams!" -- Richard T.
"We discovered Tropical Dreams Aquariums in 2003, this was after three years of substandard service and overpriced, un-needed equipment. Searching for new service we considered several companies, but only one came highly recommended... Tropical Dreams Aquariums. Our 100+ gallon freshwater tank, which is the cornerstone of our Customer Lobby, looks amazing and never undergoes any major operating issues. Fish are extremely healthy, happy and live longer then expected. We don't demand perfection from any service-based company, although Tropical Dreams Aquariums always seem to accomplish it. Having a reliable company that's consistently punctual on service visits, follows through on their commitment, is trusted and most all, affordable, is hard to find, in fact it doesn't exist. We highly recommend Tropical Dreams Aquariums to anyone frustrated with their current aquarium service or looking for new service. If this recommendation isn't enough come by and visit." -- "Dreams Do Come True"
"Tropical Dreams has been caring for the fish tanks in our Health Center for the past twenty six years We have been very satisfied with the service we have received. Or aquariums are always clean, and they add to the overall beauty of our environment. Thanks Bill for all of your hard work! Tropical Dreams is THE BEST!! Do not waste your time with other design companies. Bill designed has been managing my 150 gal salt water tank for 16 years. My tank is always beautiful - my fish are happy & healthy. My friends always comment on what a beautiful tank I have - all thanks to Bill. You cannot find anyone better or more reliable than Tropical Dreams!" -- Richard M.
. I have had Tropical Dreams for over 20 years servicing and maintaining our 60 gallon saltwater aquarium. Our installation was done by a company that was incompetent to say the least. Not to mention the amount of expensive fish I was losing once a week. I tried one other, same results then found Bill at Tropical Dreams. He is full of integrity, always on time, very consistent, extremely thorough and I haven't lost a fish in a very long time. I still have a couple of fish that are still alive after 20 years. If you want a beautiful aquarium with low maintenance on your part contact Bill...Don't waste your time or money otherwise." -- Liz S.